"Just command, efficient, the ability to use the cutter, obviously, in that lane, but then at any point, to back-door slider you. He was really, you know, it's kind of the reports we've been getting if you watched his outings kind of leading up to this as he was working his way back. "I feel like he's been pretty sharp overall and it's been real smooth, and today, it was just real pitch-efficient, and that's classic CC right there, generating a lot of weak contact." Boone said of what it was like to see Sabathia on the mound and stabilize what had been a rough week for the team, "It means a lot to that room, that he came back and to see him go, you know, long before I got back here, he's always been that guy I feel like that's, you know, you need a big outing coming off a loss or something, and he seems to always deliver in those moments. For him, start of his final season, first start of the year, to come out and really just have the emotional command as well to just really lock in and continue to execute pitches, was a lot of fun to watch him be so efficient in his first game." On whether he thought of sending Sabathia back for the sixth, Boone said, "Yeah, and he fought me a little bit. I knew I was only going probably eight or ten more pitches, and could I really get him through that next inning? I didn't really think so, and then I was like, five shutout right now, and we really felt good about Domingo coming in in that slot behind him and using him however we needed, so it kind of worked out perfect, but it was tough taking him out because he was on such a roll, and he had theoretically another, I would have probably, 10 or 15 more pitches possibly." German entered with the game still scoreless and he threw two shutout innings, allowing no runs, hits, or walks, with four strikeouts. The only runner Chicago had against him came when second baseman Tyler Wade was given an error when he couldn't make a throw from the outfield grass on a play with the shift on. 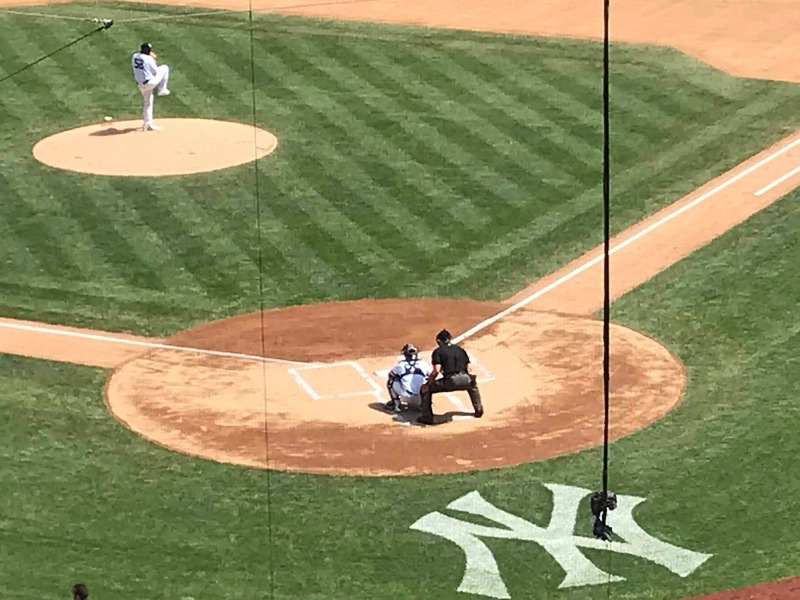 Chicago starter Ivan Nova, who pitched for the Yankees from 2010-16, made his first start at The Stadium since he was traded a few years ago. Nova pitched into the seventh inning, when he allowed a leadoff single to Torres, and he was lifted at that point, and walked back to the dugout to a nice ovation from the Yankee Stadium crowd. Aroldis Chapman came on in the ninth and retired the Sox in order, giving the Yankees a combined one-hit shutout. The Yankees's four pitchers also did not allow a walk and struck out nine. Boone said of how valuable it was for the bullpen to have a solid outing, "They were really good. For Domingo to come in in that role, obviously, just in between starts here, and really come in. What was impressive about him was his feel for his secondary pitches right away, came in spinning it, had a good change-up and followed up CC, was really pitch-efficient, in complete command. "Then for Zack (Britton) to come in and be as crisp, that's about as crisp as we've seen him. Flashed a good breaking ball there for a strikeout, but the stuff was good and he was real sharp, and then Chappy (Chapman), you know, we're probably going to get Chappy in the game almost no matter what, you know, I think it's been six days since he's been out there. To see him come in and, not only throwing hard and you see the stuff, but just the command he had and the ability to flip in the slider as well. The pitchers were great today."